This holiday season, the Lloyd Center for the Environment was invited to participate in the Tiverton Four Corners’ First “Re-Tree Event: A Showcase of Trees Created with Recycled Materials”. Organizations that participated in this event designed and built a Christmas tree out of at least 90% recycled materials. The trees were revealed in an annual festive showcase and will remain on display in Tiverton Four Corners through January 4, 2014. Lloyd Center staff and interns built the base of their tree with three large boat rope spools piled on top of one another. These spools were drilled together and then festooned with all the trappings of an underwater piling. Handcrafted clay barnacles cling to the middle spool; a paper mache octopus peeks out from the bottom-most tier. 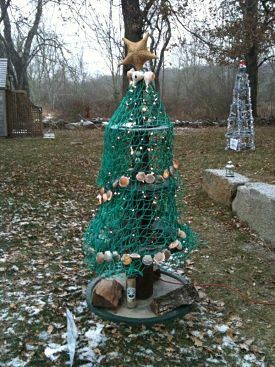 Leftover shells from the Lloyd Center’s touch tank, oyster shells from Mattapoisett’s Turk’s Seafood Restaurant, and scallop shells from New Bedford’s Northern Wind Seafood complete the tree’s vibrant base. The lime green “branches” of the Lloyd Center’s nautical tree were cut from a large fishing net that washed up on the Center’s property years ago. Threaded through these branches is a string of glowing scallop shells, handcrafted and generously donated by Jayne St. Pierre of Mattapoisett, MA. 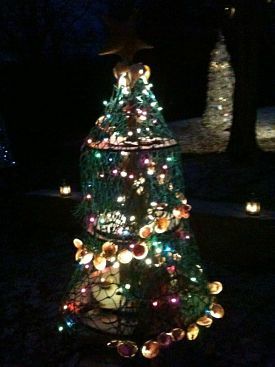 Finally, floating atop the tree is a radiant sea star, up-cycled from the Lloyd Center’s collection. The Lloyd Center’s nautical tree represents much of what our organization is about: an appreciation of coastal habitats, teamwork, and the celebration of community. This project would not have been possible without the generous donations that were received from Turk’s Seafood Restaurant, Northern Wind Seafood and Jayne St. Pierre.